The Hejnar family of quick release clamps was enriched by another member recently. 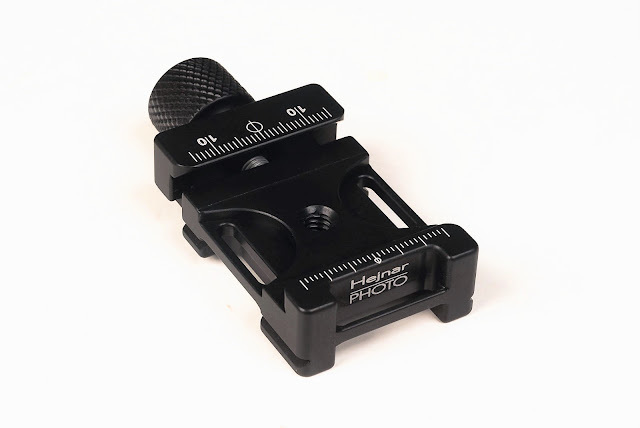 The new Hejnar F61-2b quick release clamp is a variation of the most recent Hejnar PHOTO F91b 1.5" Quick Release Clamp (preview) keeping the characteristic Arca-Swiss® compatible Dovetail on the bottom, while adding three strap loops. 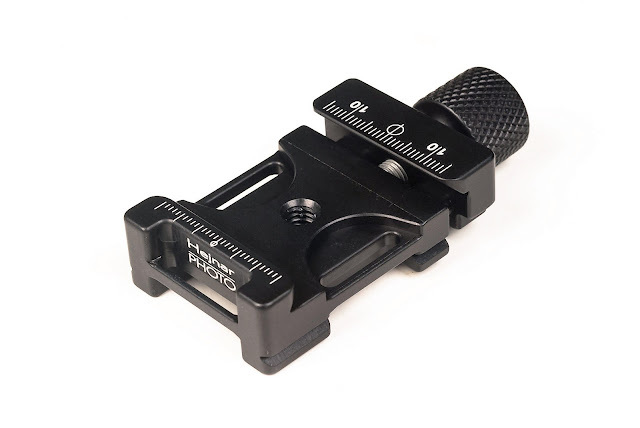 Quick Release clamps featuring strap loops are meant to facilitate quick attachment / detachment of straps on a camera already fitted with an Arca style base plate or L bracket. The extra dovetail though allows the quick mounting of the camera on a head equipped with an Arca stle clamp as well, without removal of the straps. 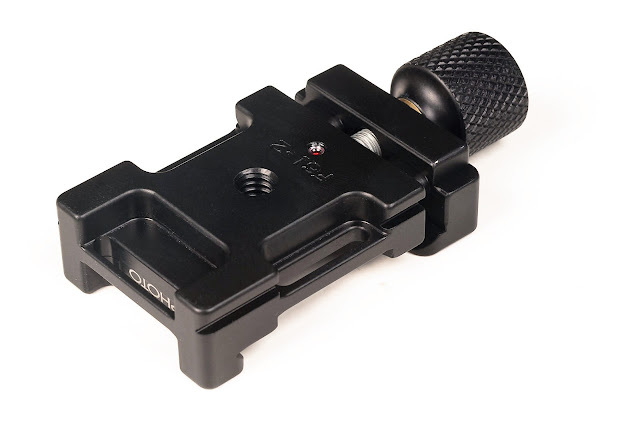 Since the bottom dovetail on the F61-2b is perpendicular to the clamp jaw axis, serves also for switching orientation when the clamp is mounted inside other clamps. 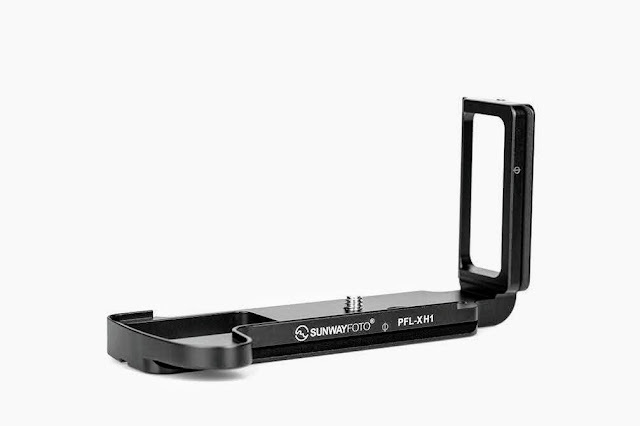 Something useful when switching between a collared lens plate and a camera plate frequently. The top side of the F61-2b is identical to the F91b QR clamp concerning the decimal scales on both jaws and the safety stop relief grooves. Same applies to the tongue in pocket design of the moving jaw guides which guaranty a long term impeccable operation by not allowing dirt and grit entering the clamp interior. Nevertheless similarities stop there. 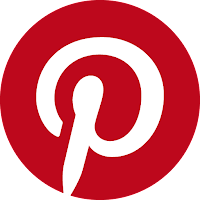 The center hole is not countersunk and smaller having an 1/4"-20 thread instead of 3/8"-16 to allow for direct mounting of the clamp with 1/4"-20 screws. While the three strap loops one at the front and one on each side change the appearance dramatically. The bottom side, is completely new since the addition of the dovetail and the three strap loops. The moving jaw is somewhat recessed on the sides allowing clearance for the dovetail use. Nonetheless, besides the strap loop cavities there is extra material removed from the bottom front so as to maintain the weight very low. 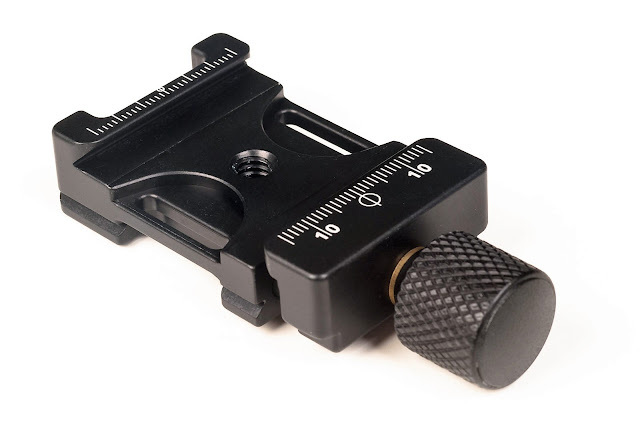 The small and short black knob with the diamond pattern is identical on all smaller Hejnar QR clamps bearing the "b" at the end of the model name. 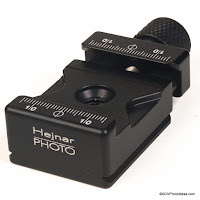 Current price for the F61-2b clamp is US$ 55.00 (+Shipping where applicable) and is available from the Hejnar Photo Store.